If you follow the news, the 21st century doesn’t seem to be going so well. From 9/11 to the Great Recession, the Syrian civil war, the Ebola epidemic, growing inequality, racial unrest, and bitterly contested elections, the world seems to be sinking into chaos and hatred. Moralizing commentators tell us that the decline of religious belief and close-knit communities has left us spiritually adrift, without a grounding in moral values, so it’s no wonder we’re suffering through an epidemic of loneliness, unhappiness, and suicide. And then there are the futurologists who speculate on what will finish us off first: resource wars, nuclear annihilation, unstoppable climate change, or robots that steal our jobs, enslave us, and turn us into raw materials. But, as Steven Pinker argues in this landmark new book, we do not truly inhabit a dystopia of deprivation and violence: in fact, every global measure of human flourishing is on the rise. We’re living longer, healthier, safer, and more affluent lives-not just in the West, but worldwide. Why? In 1784, philosopher Immanuel Kant asked, ‘What is Enlightenment?’ It was, he argued, humankind’s emergence from its submission to the ‘dogmas and formulas’ of religious or political authority. The Enlightenment ushered in a new approach to society based on science, reason, humanism and progress. 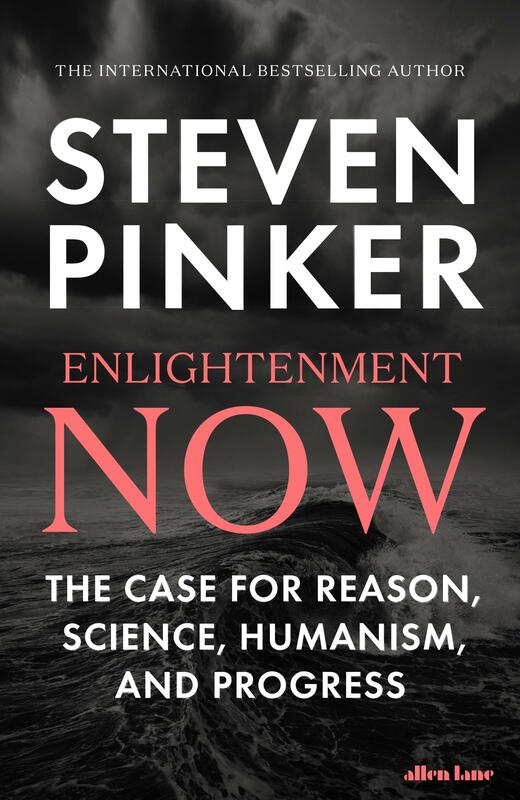 In this magisterial work Pinker looks at how the world has evolved since those beginnings of a new way of looking at the world based on those premises. On almost every measure the world today is a far, far better place than it was in the 18th Century, the 19th Century and the 20th Century. Humankind is healthier, cleverer, safer, wealthier, better governed, and on almost every other measure better off. Life expectancy is growing, people live longer, and are freer from disease; fewer people live in extreme poverty, more people are receiving education, fewer people die from war or violence, and people are happier. These gains are the result of progress and the spread of Enlightenment values. Economic, political and social progress has lifted many people out of poverty, out of ignorance, and out of illness. Of course, many of us will point to the threat of climate change, or to the current political instability and suffering in the Middle East, for instance, but Pinker convincingly argues that the overwhelming trends are positive and that the efforts of people to make meaningful change are effective and do produce results that change our lives and our planet. This timely and controversial book is essential reading.